In many organic synthesis 'British Drug Houses' precipitated copper powder is used as catalyst. I always thought, that's common copper powder, which can be made from copper sulphate solution and zinc. But now I saw a direct contest between this freshly prepared copper powder from CuSO4 + Zn (=A) and the 'British Drug Houses' precipitated copper powder (=B). After several runs A gives a maximum yield of 83% of a desired organic compound. Under similar conditions B gives a yield of 98.9%. So what's the mystery of the 'British Drug Houses' precipitated copper powder? 'A' is already very fine and has a big surface, so this point can't be the reason for B's superiority. Has B some additives? Why is it soo much better?? Since I can't find any useful information neither in Roempp nor in Ullmann's and even not in the CA: Has anyone information about 'British Drug Houses' precipitated copper powder? Visit the German synthesis collection LambdaSyn and our new LambdaForum! As far as I am aware the British Drug House became BDH, which became part of Merk, which is now part of VWR. I think the the stuff you are talking about is because they have been making it for years and make it better than anyone else. The spec. on BDH stuff was fairly high and their containers were very good. You can of course make copper powder yourself, by reducing it straight from solution. Not Zn powder, as the resulting Cu powder is at least the size of the Zn powder. Whereas precipitation straight from a copper II+ solution should yield nanosized Cu particles. Here was my attempt at this, I boilded a CuSO4 solution (10g) and added 5 g of Vit C (ascorbic acid). The solution turned dark green (from blue), and soon after, copper powder was precipitated. This is several grams worth. I tried to upscale this, but no success - I am not quite sure how the stoichiometry of the reaction would work out. Also, gas is devoloped during the course of the reaction. The copper powder is so fine it coated a teflon-coated stirbar with it. Anyway, this is something you may want to try. PS what sort of reactions would you use the Cu powder for? Examples? PS it is definitely Cu, as it is totally unreactive to HCl (Cu2O reacts with it), plus it is very heavy (hence easily washed and isolated). Could acetic acid be used instead? What if, what is isn\'t true? Chemoleo, are you sure that this is actually metallic copper? I have a feeling that this is could be cuprous oxide (Cu2O). It has exactly the same colour as copper and can be mistaken as copper powder very easily. Very fine copper powder can be produced by heating black copper oxide in a stream of hydrogen. The resulting powder is so fine that it produces a perfect shiny metallic surface on pressing it with the blade of a knife. The Cu powder should serve as a catalyst in the reaction of 5-iodovanillin with sodium methoxide to syringaldehyde (I've got only a theoretical interest in this way). For more information see Can. J. Chem. 31, 476-483 (1953). You can find the contest of both Cu powders (A and B) on page 5. Garage chemist, yes it is copper. I have played with commerical Cu2O before, and it is 1) a darker colour than Cu and more importantly 2) soluble in HCl, forming first insoluble WHITE CuCl, which then is oxidised by air to green CuCl2. There is definitely not even a hint of a reaction. But let me do this test with conc HCl again, I used only a 5 molar solution. Anyway, the heaviness is also indicative of Cu, as it really sinks immediately. QUite unlike Cu2O, which forms more of a suspension and takes a few minutes to settle. PS Quantum, no you cant use HAc. You have to use something that is strongly reducing, and ascorbic acid is strongly reducing. Edit: you can get fine and shiny copper powder from arts supplies, too, as it is used as a filler in polyester resins to produce the coppery look! i.e. tiranti for starters. OK, when it doesn't react with HCl then it's surely copper. You may want to thoroughly wash and dry the powder and then test the electrical conductivity. This would be the final proof that it's copper. Where did you hear about the reaction of CuSO4 with Ascorbic acid? This is very interesting! I never heard of a "wet" reaction that produces metallic copper before, hence my thoughts about Cu2O. I'd still produce copper powder from CuO and H2 though. The copper powder comes out perfectly dry and I hate drying wet precipitates. Hmm, I had a look at it now, and the 5M HCl which contained the copper powder has become very slightly green. I guess that is to be expected - i.e. oxygen aids in dissolving small amounts. Washing this, and adding 35% HCl didnt change things really, except that a slightly green colouration was noticed, which didn't become more. Compared to this, when I dissolved commercial Cu2O, it would dissolve immediately to form white CuCl. What is more peculiar that my copper powder, the batch that was left to dry, turned brown coloured - not all, only what was under the surface. So now I have a powder consisting of dark grains together with the copper coloured grains. I suspect the fineness of the Cu was enough to be oxidised by air, in the presence of trace acid and water? A bit strange nonetheless. But then, who has played with nanosized Cu before? When I get back, I will measure whether any current is conducted. I wish I had done that yesterday, as now it contains this brown/black stuff (it's very hard to say, as the particles are so small). Actually I will take half of that batch and try to redissolve it in HCl, I should remove the oxide that way presumably.. Anyway, that method is something I tried way back, when I had restricted amounts of chemicals. I was hoping to make Cu2O then, to turn this into CuCl. But as you can see I never got it to work then. Reducing CuO with H2? Hmm... and the hassle of heat, hydrogen gas and so on? I am not quite so sure about that! Definitely more hassle than just boiling a solution. But then... H2 reduction is certainly more economical and quantitative! Edit/Followup: Ah ok, no problem about the dark brown powder. It seems only coated at the surface. When adding 5M HCl, it turned immediately back to the rosy copper colour - and the solution above turned ever so slightly green - indicating a very thin oxide layer! I guess that's to be expected with finely divided copper like that; even copper sheets tarnish after a while. Yes, it definitely conducts, meaning it is truly copper. Because the powder so rapidly oxidises in air, I cleaned it with HCl, and then measured the relative conductencies of the supernatant (the liquid (water) containing no copper powder, and the precipitate (copper powder and water). The supernatant had about 500 kOhm, while the precipitate in the same liquid went down to 10-40 kOhm. Not ultimately a proof, but taken together with the chemical & observational data, I now have no doubt it truly is copper precipitated straight from a Cu2+ solution. Apart from that... I rubbed the powder onto a surface, and it actually became shiney, as one would expect from a metal powder. But most convincing to me, anyway, is still how quickly the powder settles. It doesn't take 2 seconds. Only a high density compound would behave that way. PS to keep the powder reduced, I'd suggest to dry it in a vaccum dessicator, or over nitrogen/Ar/CO2 etc, and to keep it dry and away from air at all times. To me, the fact that it oxidises so happily actually shows it has a decent surface area (i.e. being very finely divided). After the copper powder was precipitated and filtered, what color was your filtrate? Mine is still bright green. What is this due to? Some copper ascorbate compound? Obviously I just tried this but the ammount of copper powder I got seemed like under a gram. The ascorbic acid I was using was commercial vitamin C but they were by some hippie brand so I had to filter out some insoluabe particles. The solutions of copper (II) sulfate and ascorbic acid were combined while hot and were left for the copper powder to precipitate. I recieved no gas emmited during any stage of the reaction. I am going to try boiling the green filtrate for a while, to see if any more copper will precipitate. Yes it was still green, dark in my case (I guess I made sure to use an excess ). Copper ascorbate - I'm not sure. It would imply that ascorbic acid is stronger than H2SO4, which surely it is not. Yet the colour change seems to suggest that. It baffled me too. As to the amount of copper - weigh it. It has a rel. high density, making you misjudge the amounts. As to gas - it evolved slowly, while I continued to boil it. I can't really say whether this had an effect on the yield. In fact, I was baffled by the yield alltogether, as I added more CuSO4/Vit C to the existing reaction, but no more Cu seemed to precipitate. What might help is actually to construct a mechanism of the reaction. Also, if you continue boiling it down, the colour will go very dark, and a distinct smell is produced - to my nose it smells like decomposing sugars. PS good to see someone else is doing some experimenting! Chemoleo, were you using lab grade ascorbic acid or OTC vit C? After disolving my vit C in water the aqueous layer was yellow so I am assuming some other impurities are in vit C. After filtering the hot dissolved VitC the residue left in the filter paper smelled strongly like citrus and unlike the vitC tablets prior to purification. Hmm, possibly because I was using citrus flavored vitC . I attempted this reaction again moments ago and I appear to have gotten much more copper powder than before. Last time as I was filtering the citrus impurities out of the Vit C I just had the stem of the funnel leading into the copper sulfate solution. I assume this lead to some cooling of both reactants. However this time I allowed the filtrate from purifing the vit C to go into a 250 mL beaker. The solutions of copper sulfate and vit C were separatly heated to nearly boiling then mixed quickly and boiled again. I recieved much more copper powder than before. 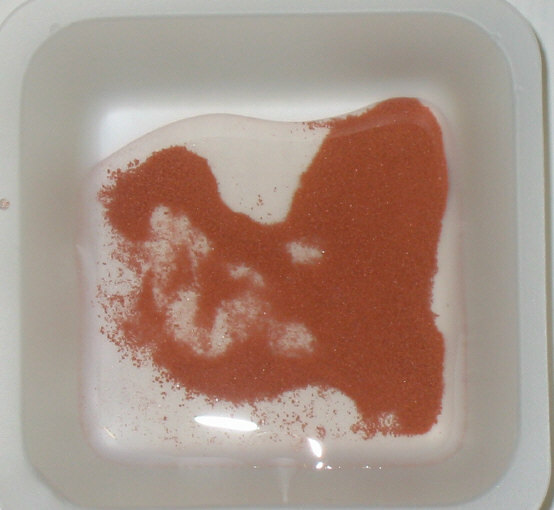 Also, Chemoleo, in your pic of the copper powder, did it look like that upon precipitation and filtering? Or is that pic after you rinsed it with HCl? Mine is much darker after precipitation and filtering. There's already a method for making nano-sized copper powder with ascorbic acid in the Chemical Abstracts. The use of PVP is just necessary, if even a finer product is desired. The mol-ratio is the most usefull thing in the following text. Copper nano-powder was synthesized with bluestone (CuSO4×5H2O) as starting material, Vitamin C (Vc) as reducer and polyvinylpyrrolidone as protectant and dispersant. After Vitamin C (Vc) was mixed with polyvinylpyrrolidone (PVP), the mix was added to soln. of bluestone. When the ratio of n(Vc) and n(CuSO4×5H2O) was 2.45:1, the particle size increased while the increase of reagent concn. In this way, the yield of copper powder was 95%. Structure of products was 20-40 nm confirmed by XRD and TEM. The copper powder you see on the picture is the water rinsed powder straight after the precipitation reaction- no HCl involved. I only used HCl to remove the brown coating after I allowed the Cu powder to dry on air. If yours is darker - I wouldnt know why. As long as it does look like copper, and sinks very rapidly to the bottom of the tube/beaker, you should be fine. Is there a method for Aluminium powder? Elemental aluminium is too reactive to be formed in water. However, it may be possible to form powders of other unreactive metals, such as bismuth, lead and tin. Now what would be impressive would be someone figuring out how to easily make aluminum powder by a similar reaction, but in a solvent other than water, that aluminum will not react with enough to spoil the reaction. Have to be careful drying the precipitate, that fine aluminum would be pyrophoric, I imagine? CuSO4 + Ascorbic acid, does the remaining sulfate combine with the H+ to form sulfuric acid? Possibly it would. It would be interesting to follow the pH during the course of the reaction. Anyway, I weighed my yields from the two tries at this experiment. The first trial yielded 0.2g of a dark red precipitate, the second trial yielded 0.6g of identically colored precipitate. The precipitated powder was added to dilute HCl to attempt to remove any oxide coating(and I wanted it shiny ). This was unsuccesful, the precipitate retained its origional dark color. I believe I can attribute such low yields to the hippie brand of vitamin C.
Prepared in a specially formulated nutrient base of natural fruit pulp extracts, acerola, rosehips and the complete vitamin C complex of rutin, hesperidin and citrus bioflavonoids. Sweetened with Crystallose(tm)( a complex of phenylalanine, glucose, and cellulose)." So as I said before, a hippie brand. The tablets do taste good, in fact, having the bottle in front of me while I quoted caused me to eat a couple . I believe the fact that this vit C is ascorbic acid and sodium ascorbate may have reduced my yields due to not all 500mg being ascorbic acid which is necesary for this reaction. Tomorow I will try to obtain a bottle of (relatively)pure ascorbic acid and try that instead of this brand. PS. I currently am evaporating some of the green filtrate at room temperature in the hopes that I obtain some sort of green crystalls. I realize it will still be contaminated with the other crud in the vit C tablets, unfortunatly. I guess I should have said that when I tried Na-ascorbate (analytical) the other day, it didn't work. I haven't thought about it until this moment... in fact the picture above is the attempt with ascorbic acid rather than the ascorbate. Now I wonder why. It formed the green solution nonetheless, but yet no precipitate. To a proper organic chemist, this should sort out the mechanism I guess? PS I guess that pretty much negates what I said above, i.e. that the pH might prevent the precipitation of further copper. Because then the salt form of ascorbic acid should facilitate the reaction? L-Ascorbic acid is a reducing agent due to its enediol structure (two OH-groups with a C=C bond in between). In form of the Na-ascorbate there is a Na<sup>+</sup> instead of the H-atom in one OH-group. The resulting negative charge on the O-atom is delocalized in a p-bonding system with the keto-group (R'-O<sup>-</sup> and R"=O 'mesomers' to R'=O and R"-O<sup>-</sup> ==> delocalized electron). By this, the enediol structure may lose its reducing effect and Na-ascorbate won't reduce Cu-ions. That's just a guess and I have got no references for this. "Very fine copper powder can be produced by heating black copper oxide in a stream of hydrogen. The resulting powder is so fine that it produces a perfect shiny metallic surface on pressing it with the blade of a knife." Maybe it actually kind of welded to the surface of the knife? I was doing a reduction of CuSO4 with Al foil some months ago and found the copper produced was dark red (even if it has never hit air). Maybe it's because it was extremely porous? It might be interesting sintering the powder - could compact copper be made of it? Might be a useful way of preparing small copper equipment parts. Pure copper is dark red. It resembles terracotta somewhat.